I hope everybody had a happy Turkey Day, but now that Thanksgiving is over, the holiday shopping season has officially begun. 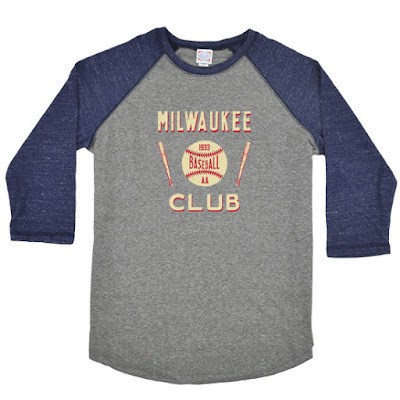 Kicking it off, our friends at Ebbets Field Flannels in Seattle have just introduced a new Milwaukee Brewers shirt for us to add to our wish list. History: One of the most interesting things about the original minor league Brewers was their ballpark. The oddly-configured Borchert Field was built in 1887 and featured left and right field corners of only 266 feet. But the rectangular shape of the outfield made center field home runs nearly impossible. When the legendary Bill Veeck owned the team he installed a motor on the right field fence to move it back when the visiting team was up to bat. A rule was quickly passed outlawing this stunt. Ebbets has used that graphic before, on a royal blue t-shirt (which is still available on their site). 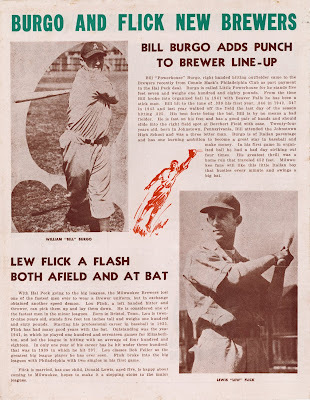 The image itself comes from the team's 1933 score cards. I love the style of this new shirt. These contrasting-raglan sleeves are quintessential baseball. As for using this graphic again, I don't wish to appear churlish; I do appreciate that Ebbets Field is giving us new Brewers merchandise. 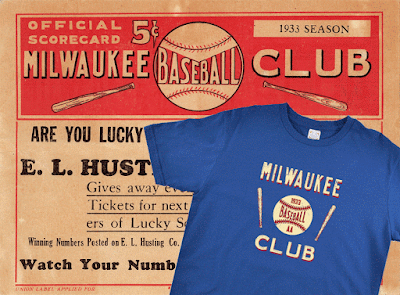 But that 1933 graphic is hardly the most uninspiring image in the Brews' history; how much cooler would that Clubhouse Shirt be if they used an Owgust graphic, such as this one from the club's 1950 letterhead? Maybe if we all continue to support Ebbets Field Flannels, we can see something like that in the future. 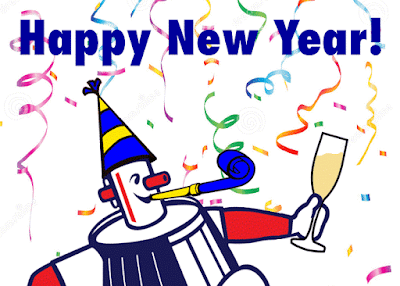 They certainly deserve our support; they're a great business, run by real baseball fans. We need them to continue to do well to keep this sort of merchandise alive at all. The only way we'll get more Brews merchandise is to show them there's a market for it. This beaming fellow is Bob Coleman, who in early 1950 was introduced to the press as the Brewers' new manager. The former catcher had been managing in the Braves' system for thirteen years; he started as the skipper of their Class A club in 1937 before taking over their affiliate in Evansville, Indiana the following year. 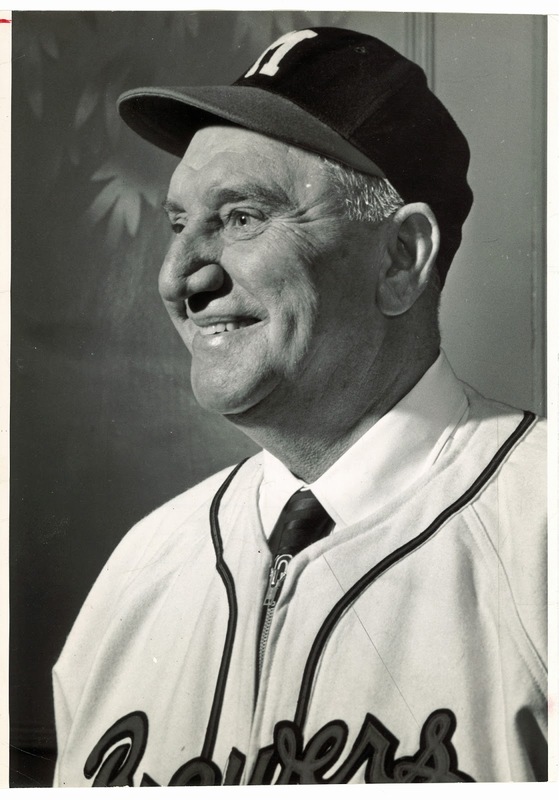 He was given a chance to manage the big club in 1943, but after finishing 68-85, 65-89, and 67-85 in his first three seasons, they shipped him back to the Evansville Braves. 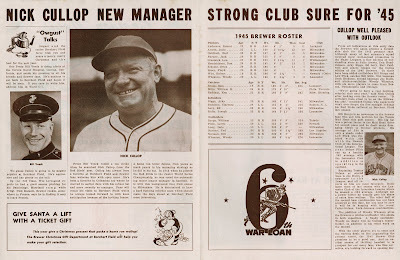 Four years later, they were ready to give him another promotion, and Boston Braves general manager John Quinn brought Coleman to Milwaukee to take over the top minor league affiliate. It's a nice fit, Bob Coleman finds as he tries on his Brewer uniform for thr first time. 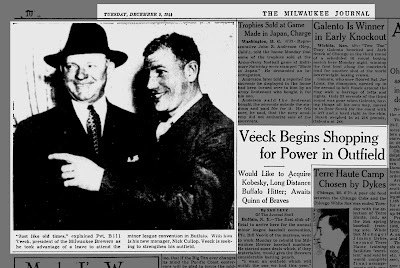 The new manager, from Evansville, Ind., is pictured on his first visit to Milwaukee when he met the press and radio. Next month his hopefuls begin training in Texas. 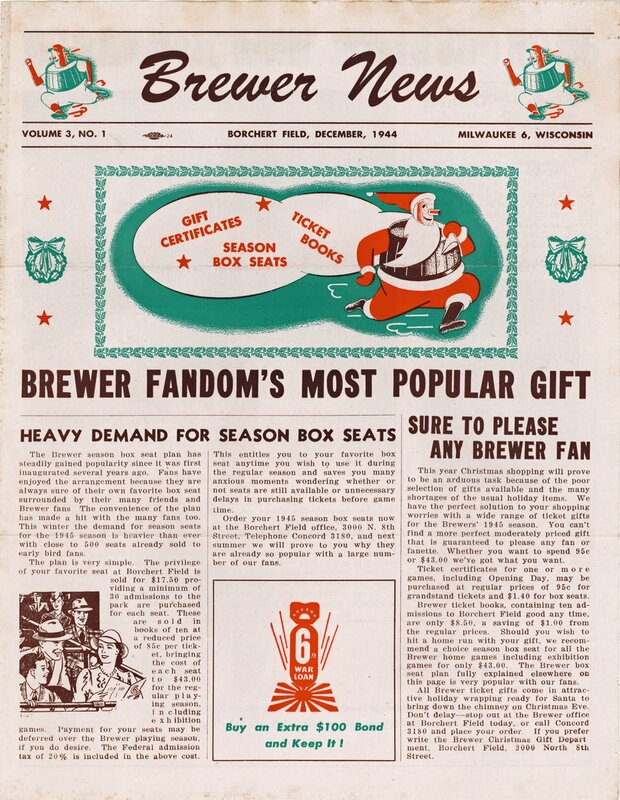 Interesting; our copy of the photo is cropped, and you can't see the tail of the "Brewers" script. But what a gorgeous jersey it is. That's the classic "Brewers" script in red trimmed with navy against the cream-colored flannel. The wordmark was first introduced by Bill Veeck in 1942, the first time the nickname had been featured on the jerseys. 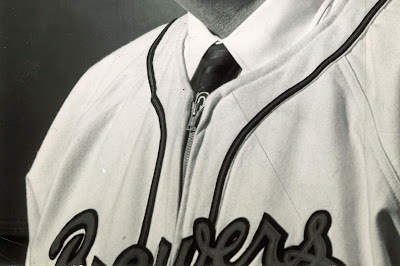 They gave him an old jersey for the press conference; by Opening Day these uniforms had been replaced with a wordmark in the same style as the parent club. Coleman wouldn't be smiling so broadly for long. Under his leadership the Brews stumbled to a .444 finish and 6th place in the American Association. That 68-85 record was the exact same as the Boston Braves his first year in charge there, but Quinn wasn't willing to give Coleman the same three years he had been granted in Boston. "Milwaukee's New Mr. 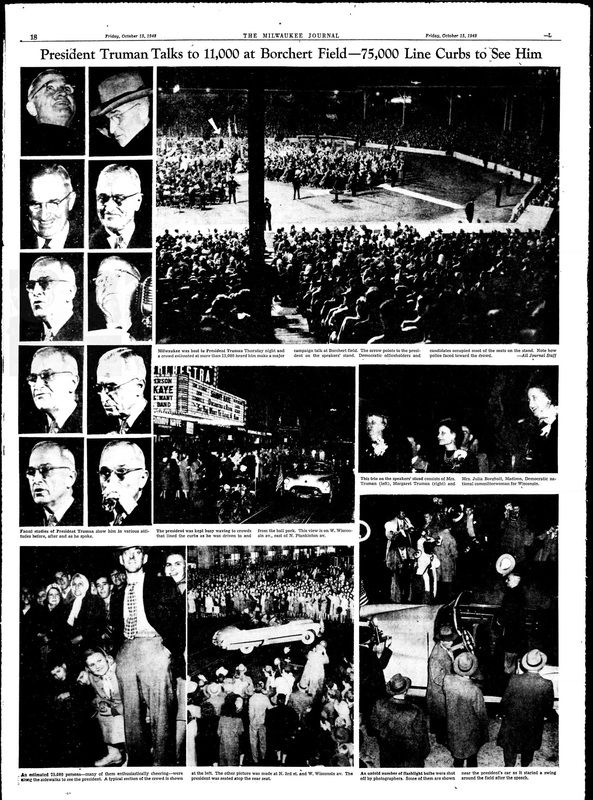 Baseball" was once again sent back to Evansville, where he managed for seven more years before retiring. To restore Milwaukee's place at the top of minor-league baseball, Quinn brought back former Brewers manager Charlie Grimm as skipper and longtime coach Red Smith as GM. Jolly Cholly and Red immediately turned things around in 1951, finishing with a 94-57 record, a seventh American Association pennant and a Little World Series trophy. 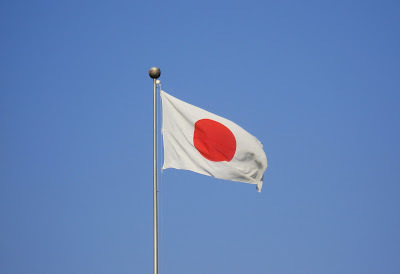 The Flag of the Home of the Braves? 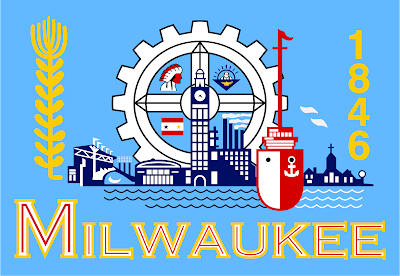 This is the flag of the City of Milwaukee. It's a cluttered mess of symbols representing the city's history, culture, industry and architecture. Among other things. In the upper-left quadrant of the gear, we find an image of a red-skinned Native American wearing a headdress. 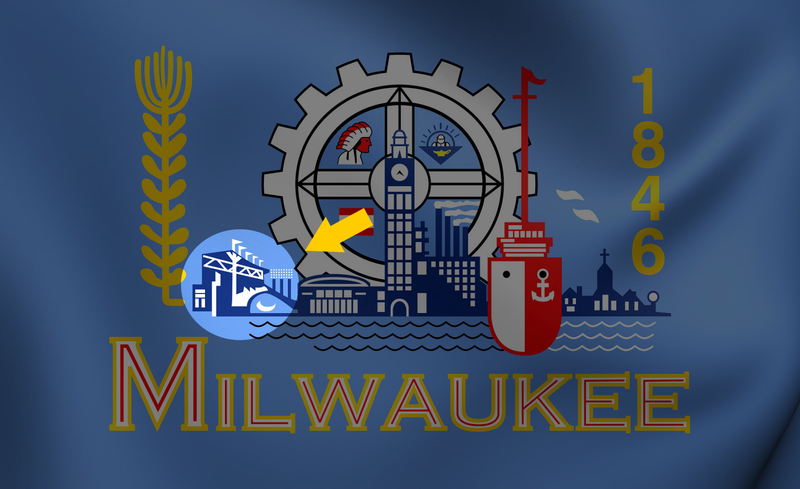 Officially, that's there as a tribute to the tribes who first settled the region, but many have singled it out as being more a tip of the (baseball) cap to the Milwaukee Braves. There's a certain amount of sense to that, since the flag was designed in 1953 and 1954, when the Cream City was absolutely crazy about her brand-new Braves. Makes me wonder; if the flag had been designed just a few years earlier, when the Brews were the city's beloved baseball team, might we be seeing a slightly different flag flying today? I don't know enough about construction techniques to speak with any authority. It looks as though they are installing the seats, which would solidly place this photo in 1952/early 1953. 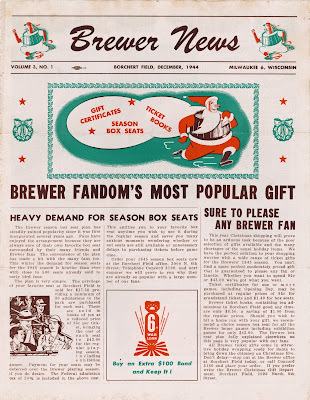 We do know that by January of 1953 the stadium was almost ready for the Brewers to move in. But is is possible that they are removing the seats to clear the way for a new addition? Did they have to do that, or could they build around them? Interestingly, that corner of the double-decker grandstand is the same part of County Stadium later chosen for inclusion in the glut of local symbols that is Milwaukee's city flag. 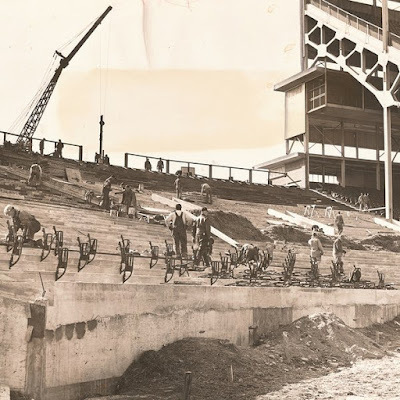 @BorchertField This picture was taken in the spring of 1954 as additional seating was being built along the 1st base line. 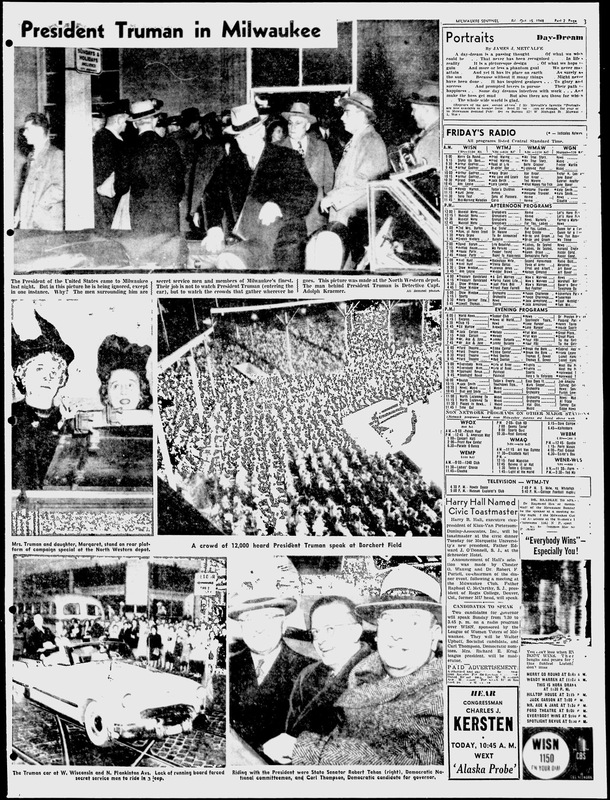 These pictures come from the Milwaukee Journal's coverage of Opening Day, 1935. Let's take a closer look at the two pictures. JACK KLOZA gave the opening day crowd at Borchert Field one of its thrills in the third inning when he pounded out a triple and hit the dirt going into third base. Kreevich is shown trying for the out. The umpire is Johnson. 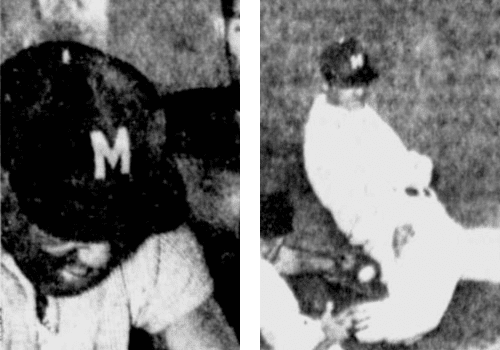 That could be the cap we were wondering about, that Brewer trainer Doc Buckner was wearing in the 1937 photo. Navy cap, white block "M", white squatchee. Minor mystery solved. The second photo shows the classic confluence of baseball and politics, as the mayor and governor were both in attendance that day. Governor La Follette, known simply as "Phil" to many Wisconsinites, was just beginning his second go-around in the Wisconsin Governor's Mansion. 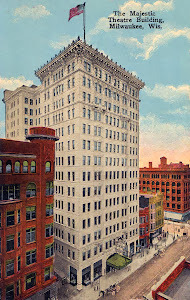 He had served in the office from 1931-33. 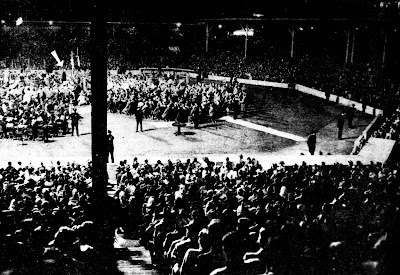 After losing the Republican primary in 1932, he co-founded the Wisconsin Progressive Party with his brother and ran again in the next election. He had been sworn in just three months before heading down to Borchert Field. Tonight, Milwaukee is the center of the country's political world—the Republican half of it at least—as the would-be GOP candidates for President gather for a debate at the historic Milwaukee Theatre. 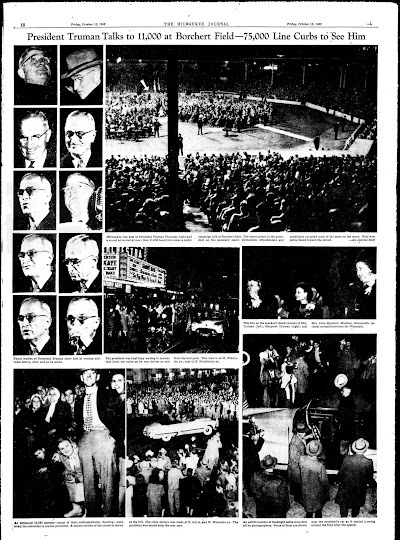 Nearly seventy years ago, on October 14, 1948, the Cream City was visited by another important political figure, as President Harry S. Truman came through on a campaign stop, part of a quick swing through Wisconsin. 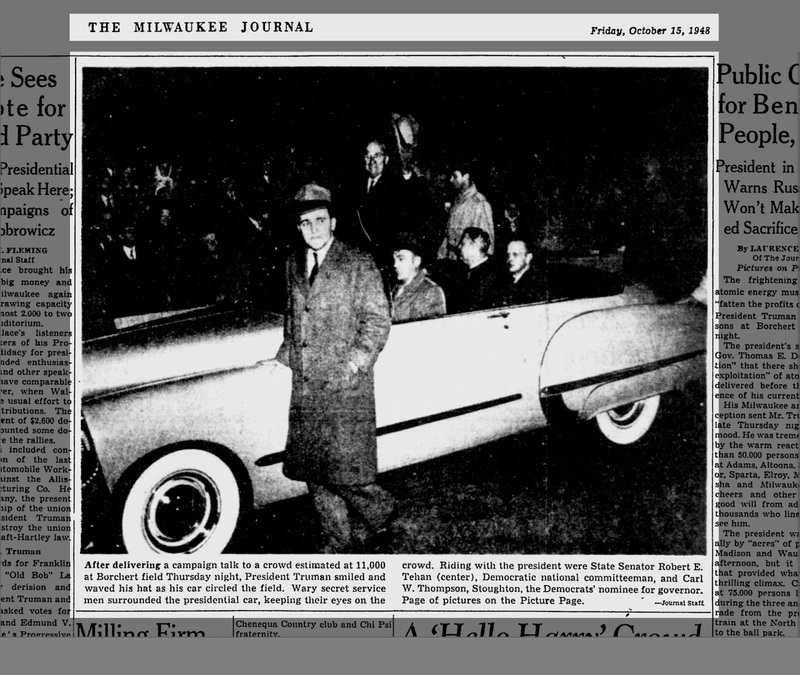 The Milwaukee Sentinel characterized Truman's trip as a "determined, eleventh-hour bid for the state's 12 electoral votes." 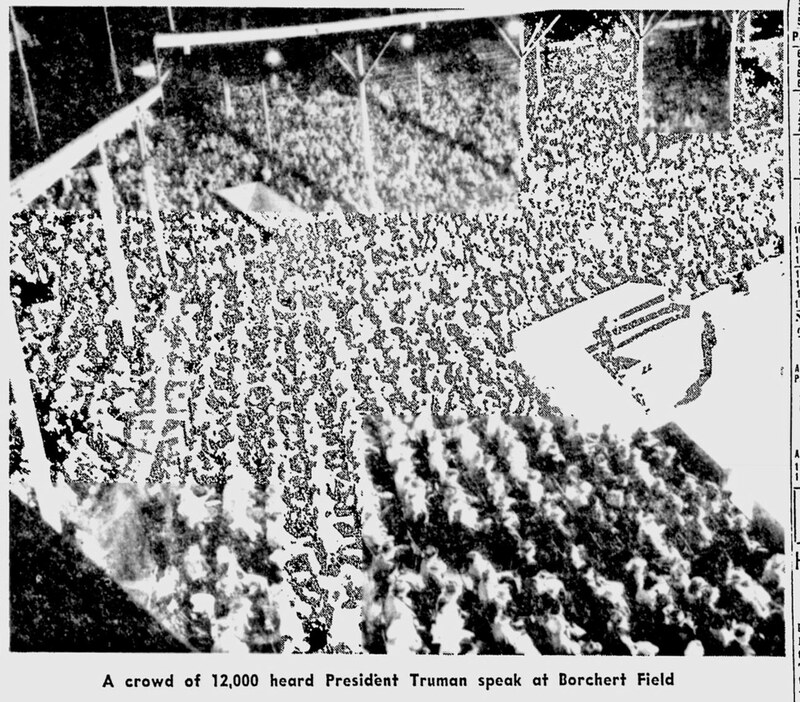 The state Democratic Party chose an outdoor venue for his speech: our very own Borchert Field. 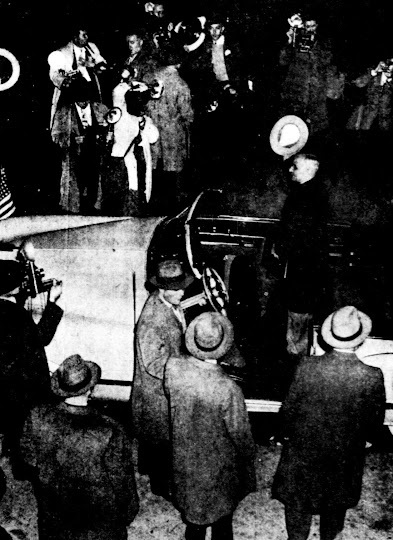 When the President and his family arrived at the downtown train station at 7:27 p.m., they were met by a motorcade that drove them to the Orchard. An estimated 75,000 Milwaukeeans lined the streets to watch the First Family drive by, and they were met at the ballpark by a huge political rally with 11,000 cheering fans. 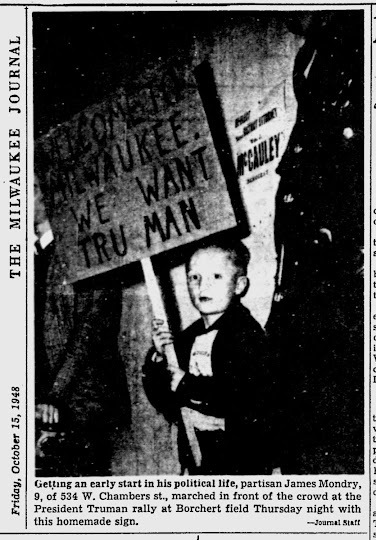 Getting an early start in his political life, partisan James Mondry, 9, of 534 W. Chambers st., marched in front of the crowd at the President Truman rally at Borchert field Thursday night with this homemade sign. This amazing photo was taken inside Borchert Field itself, showing how they set up the platform and chairs in the infield. The second shows the President preparing to leave. An untold number of flashlight bulbs were shot off by photographers. Some of them are shown near the president's car as it started a swing around the field after the speech. Drove his car around the field? 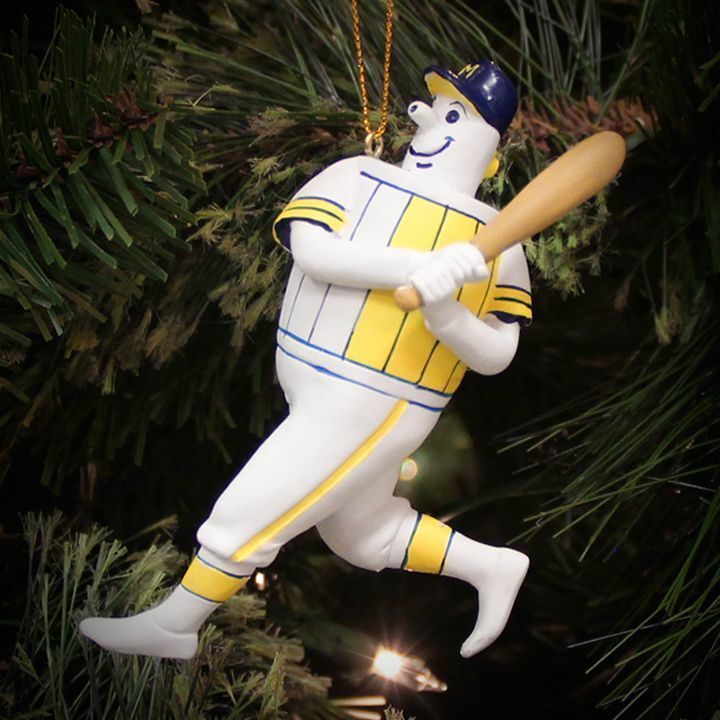 Good thing the Brewers' season was over. That was taken from atop the grandstand roof behind home plate. The police officer is standing in front of the Brewers' dugout, on the third base side. After finishing his remarks, the President was driven to the Pfister Hotel for a brief reception before boarding a train for Chicago. 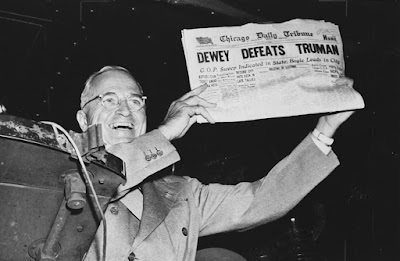 Eleventh-hour or otherwise, the swing helped, and Truman carried Wisconsin 50.70% to Thomas Dewey's 46.28% (the Progressive Party candidate received just under 2% and the Socialist just under 1%). This was all part of a come-from-behind victory that still remains the standard for political shockers. On July 7, 1937, long-simmering tensions between the Republic of China and the Empire of Japan boiled over into open conflict. A small skirmish at the Marco Polo Bridge soon engulfed both great powers in an extensive war, as Japanese forces launched a full-scale invasion of the mainland. 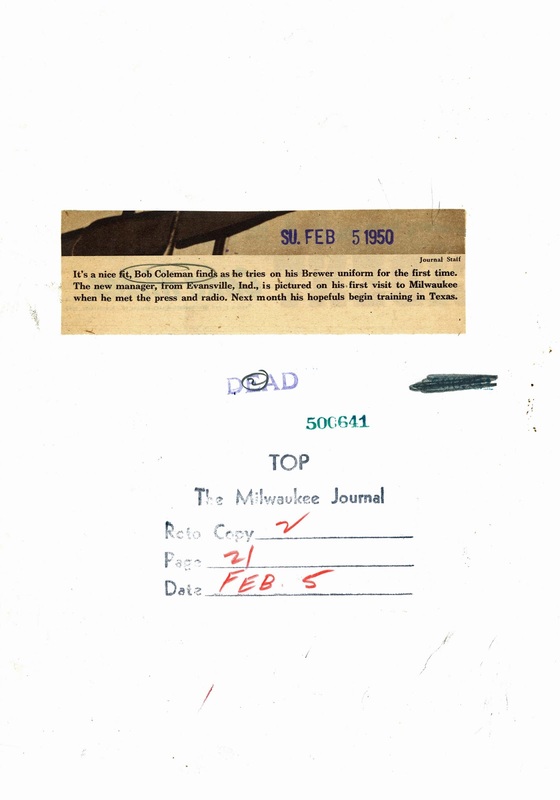 To citizens of Milwaukee, this war must have seemed impossibly remote. But the following May, the Cream City found itself facing a small but curious reverberation of that conflict from the other side of the globe. 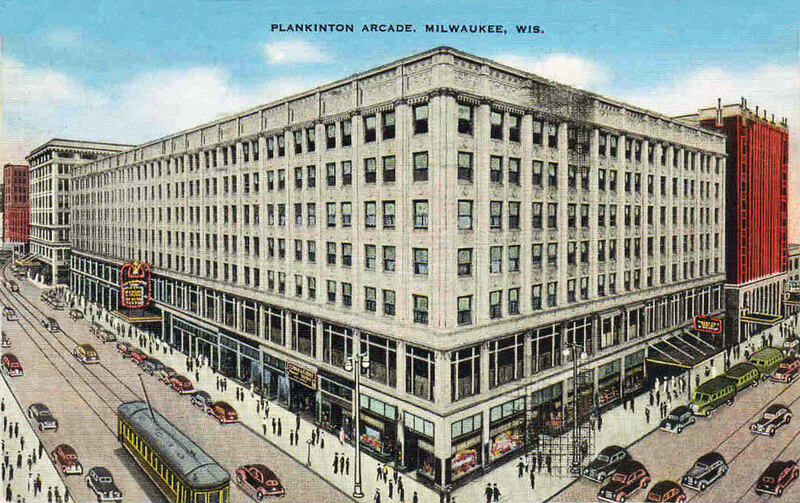 Milwaukee property owners have international complications, as well as high taxes and local troubles, to worry about these days. Joe Mallon, superintendent of the Plankington Building, Saturday received a protest from Milwaukee Chinese that the building was unduly favoring Japan in the current oriental war. 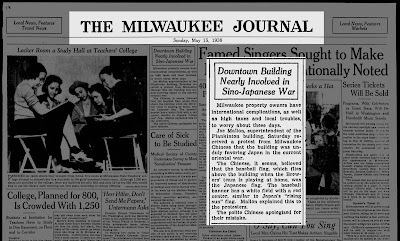 The Chinese, it seems, believed that the baseball flag, which flies above the building when the Brewers' team is playing at home, is the Japanese flag. The baseball banner has a white field with a red center, similar to Japan's "rising sun" flag. Mallon explained this to the protesters. The polite Chinese apologized for their mistake. A little confusion seems reasonable enough. 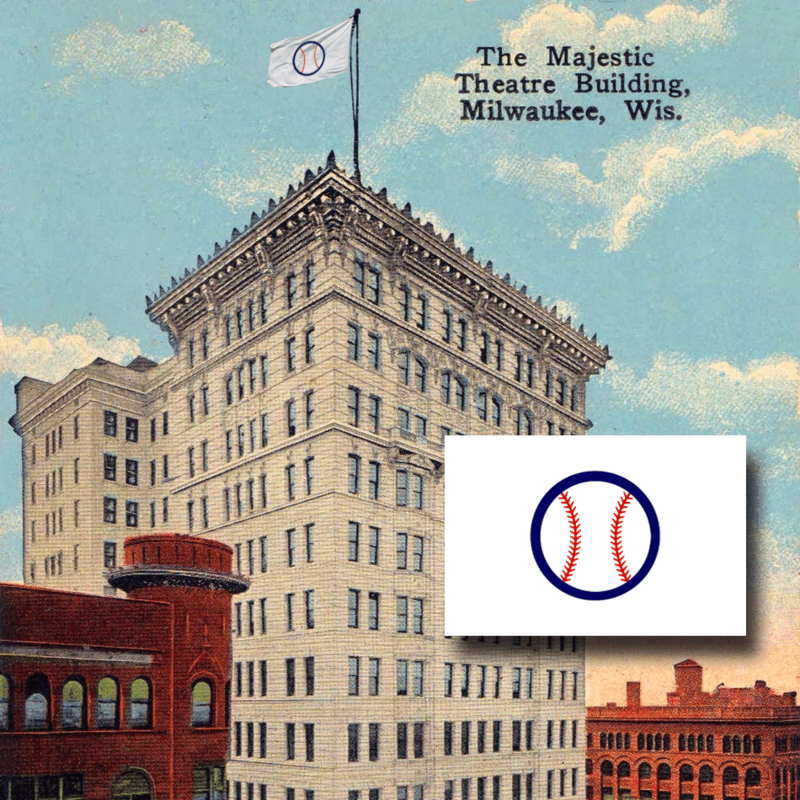 The flag was the brainchild of Brewer minority owner/business manager Bill Armour; who in the days leading up to 1913's Opening Day announced that a special flag would be flown over the Majestic Building on Wisconsin Avenue—"a white flag with a blue ball in the center"—on days when the Brewers were to play a home game at Athletic Park. No flag on scheduled game days signified a postponement. For fans a bit closer to Athletic park, he intended to line the grandstand roof with "a dozen or more" smaller pennants on game days. This may have been a last-minute addition for 1913 (Armour had only taken over baseball operations the previous January); the day before the first scheduled game, the Milwaukee Journal reported that the flag might not be ready to fly. 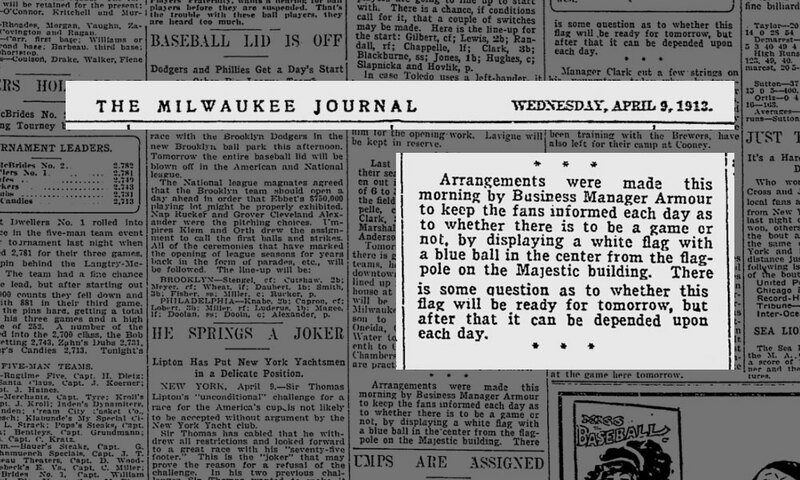 Arrangements were made this morning by Business Manager Armour to keep the fans informed each day as to whether there is to be a game or not, by displaying a white flag with a blue ball in the center from the flagpole on the Majestic building. There is some question as to whether this flag with be ready for tomorrow, but after that it can be depended upon each day. 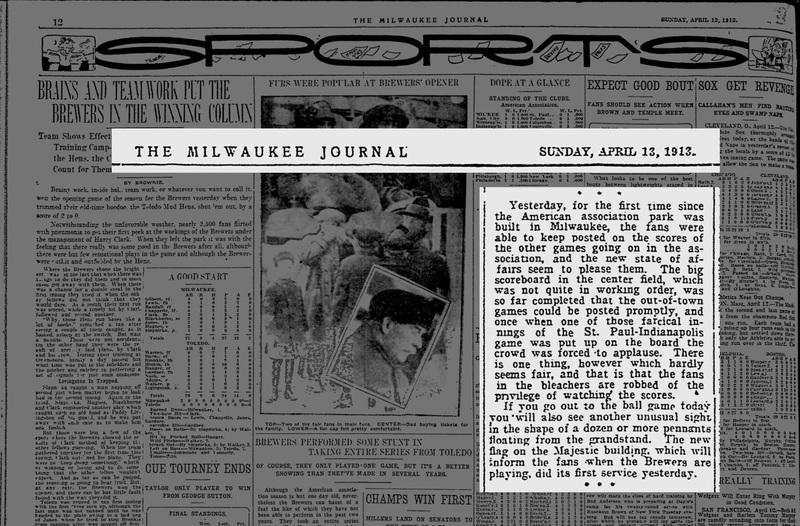 The Milwaukee Sentinel was especially positive, declaring that Armour's innovation "will prove of great convenience to the fan and will save many a fruitless journey to Athletic park during the season." The Majestic Building was chosen not only for its towering presence as one of Milwaukee's first skyscrapers, but also because it housed the Brewers' headquarters; the club had kept its offices in Room 1300 of the 14-story Beaux-Arts building since its opening in 1908. 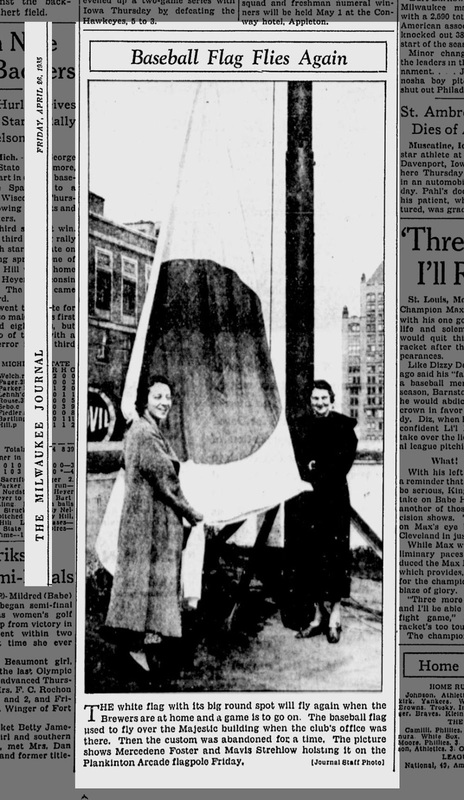 We may never know if the flag wasn't ready for the first game, as heavy rains settled in over Milwaukee and pushed the opening back two days. But when the rain stopped, the Brewers were prepared. 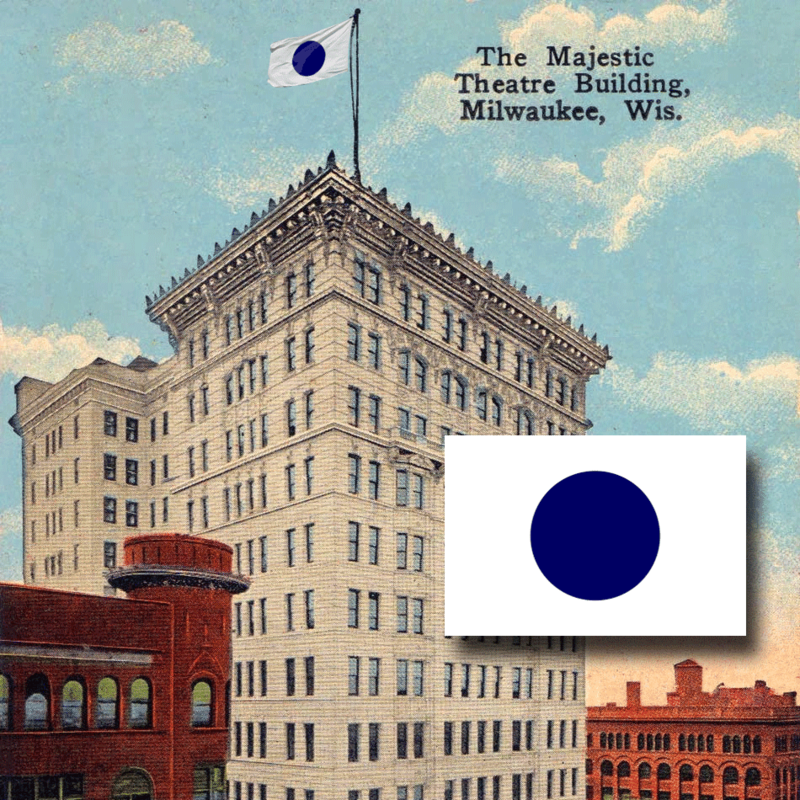 Armour's blue-and-white flag went up for the first time on Saturday, April 12, 1913, telling fans all over downtown that the first Brewer game of the season was on. 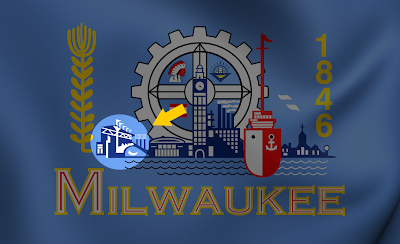 The new flag on the Majestic Building, which will inform the fans when the Brewers are playing, did its first service yesterday. I'm struck by the simplicity of the design, its abstraction. It's unclear when Armour's "Game Today" flag fell out of favor, but at some point its use was discontinued. 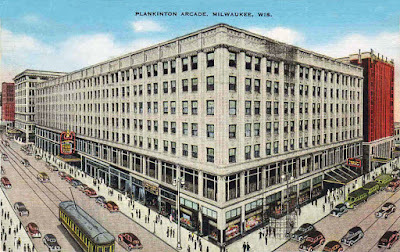 That is, until June of 1934, when the Brewers moved their offices out of the Majestic and down the street to the seventh floor of the Plankinton Building. 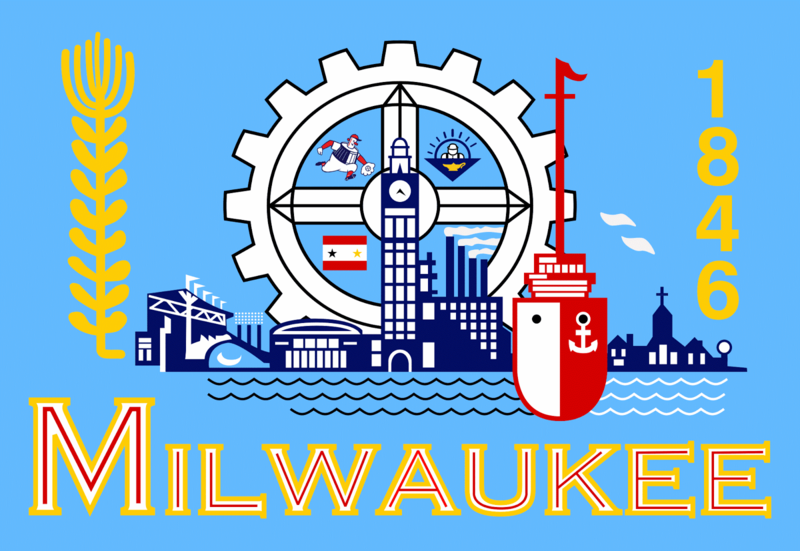 With the new location came an opportunity to revive an old tradition, and the Brewers brought their flag out of mothballs. 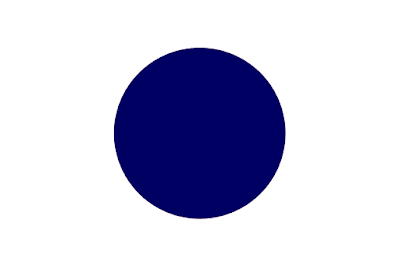 This might also have been the point when the flag switched from a blue dot to red. Flying a "Game Today" flag is a quaint tradition from an era before mass communication, when fans could look to the skyline to see if their club was playing. or do the Brewers have a home game today? 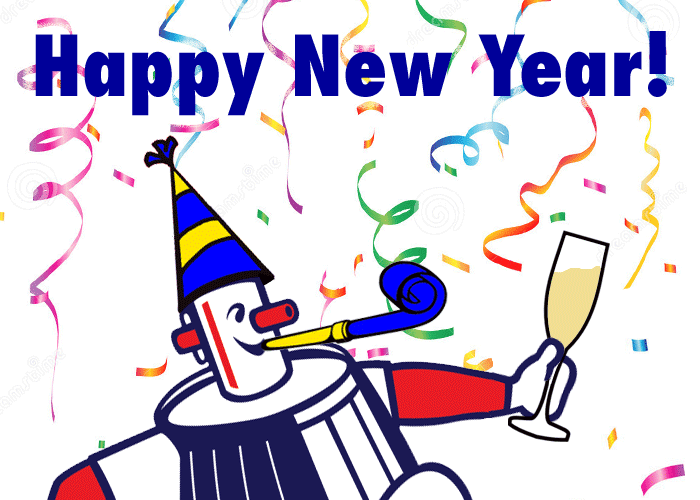 The Kansas City Royals are the 2014 World Champions. To celebrate, we offer this photo featuring members of the 1927 Kansas City Blues baseball club, which was well-stocked with former Milwaukeeans. Milwaukee is well represented on the Kaw this season, as four former Brewers are striving to put Kansas City on the baseball map. Joe Hauser, the mainspring of the Kay See club, is a native of Milwaukee and Eddie Schaack, one of the club's leading pitchers, is also a resident of this city. Ginger Shinault and frank McGowan, the other two stalwarts shown above are also former members of the Milwaukee club. Reading from left to right, they are McGown, Schaack, Hauser, Shinault. This film gives us a look at Game One of the 1917 World Series between the Chicago White Sox and New York Giants. 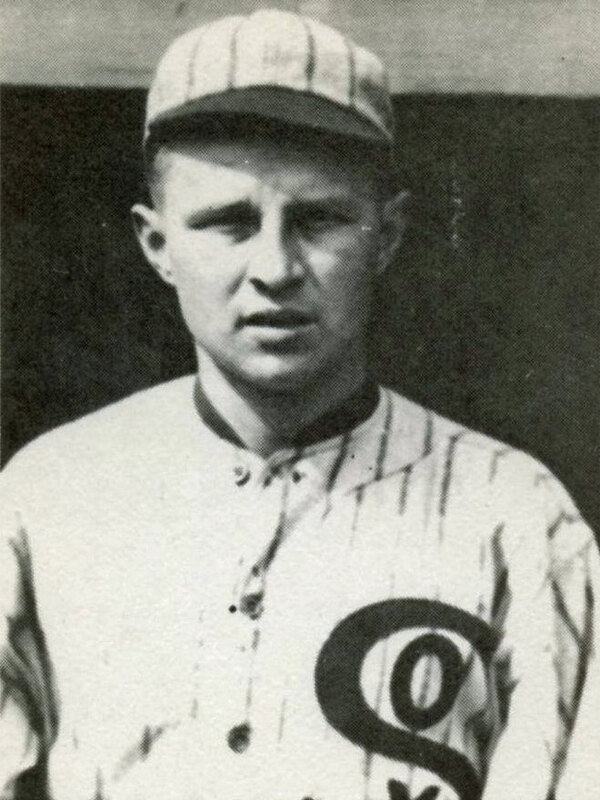 Oscar "Happy" Felsch was Chicago's starting center fielder. 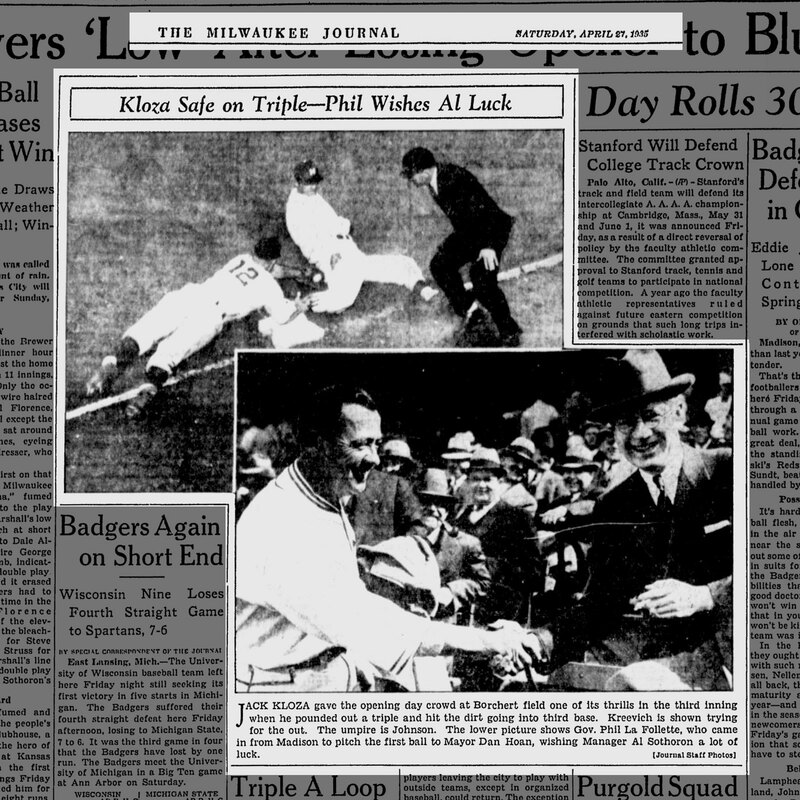 A local Milwaukee boy, Felsch was a member of the 1913 and 1914 pennant-winning Brewer squads, going to the Sox in 1915. By 1917 he was a true star. 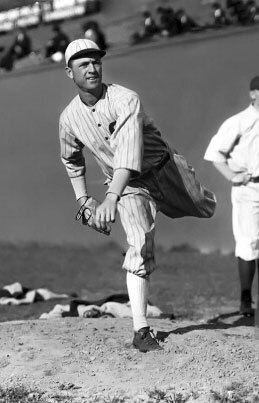 He was later banned from baseball for his part in throwing the 1919 World Series, the only one of the infamous "Eight Men Out" who ever wore a Brewer uniform. Felsch came home to live the rest of his life in Milwaukee, where he owned a grocery store and a tavern. 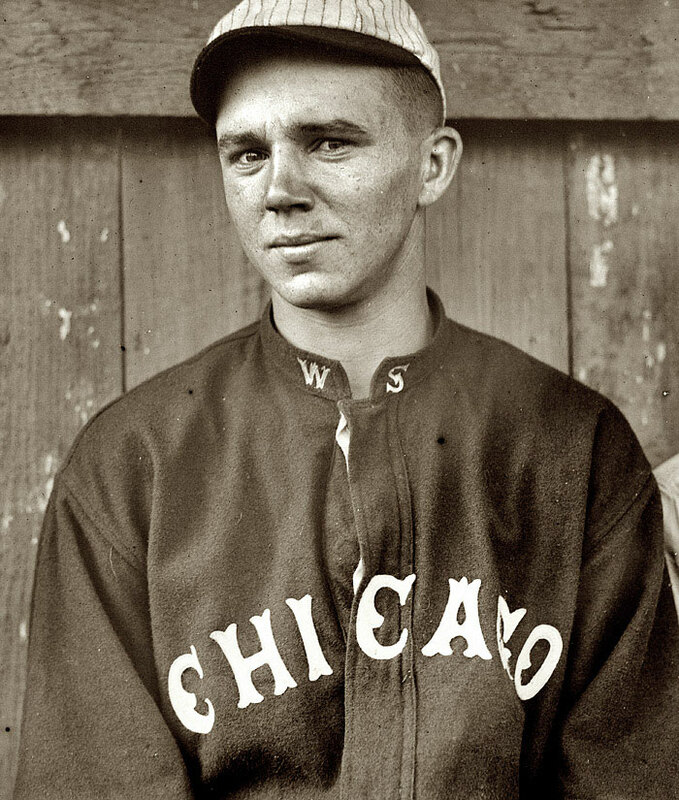 Catcher Ray Schalk, widely considered the best catcher in the majors, had played for the Brews in 1911 and the first half of 1912 before being sold to the White Sox in late July for $10,000. He played nineteen years in the majors, all but the last with the Sox. 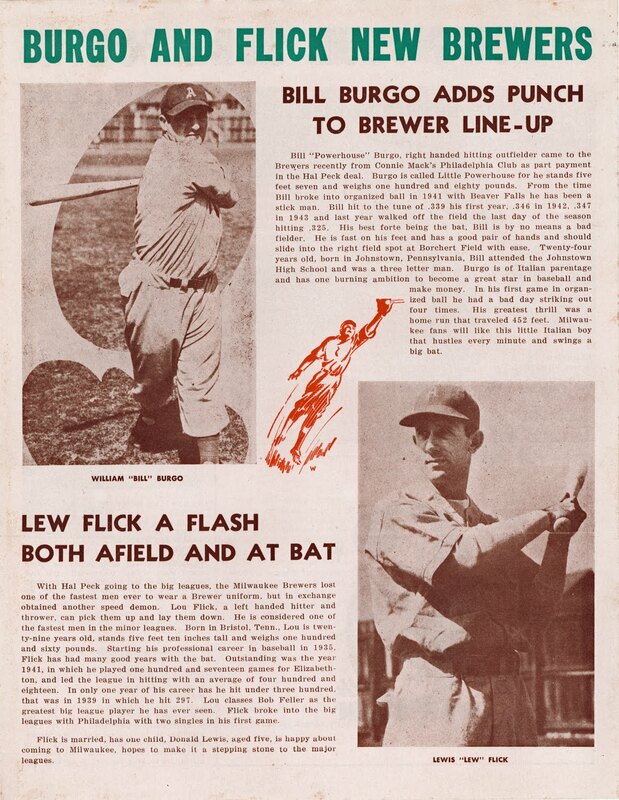 Schalk moved into managing and was the skipper of the Buffalo Bisons in 1936, when the Brewers beat them to win the Junior World Series. 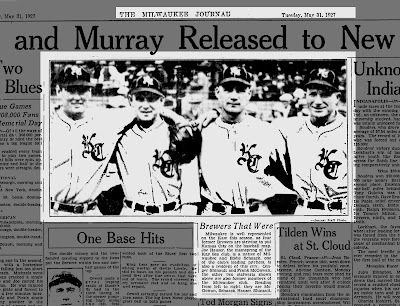 He would return to Milwaukee for a brief managerial stint with the Brews in 1940, and was elected to the Baseball Hall of Fame in 1955. Outfielder Nemo Leibold had a more circuitous route from Milwaukee to Chicago than either of his two teammates. He was a Brewer in 1911 and 1912 before moving to the Cleveland Indians, who traded him to the Sox during the 1915 season. After his playing days were over, he had two managerial stints in the American Association; first with the Columbus Red Birds (1928-32) and the second with the Louisville Colonels (1944-48). 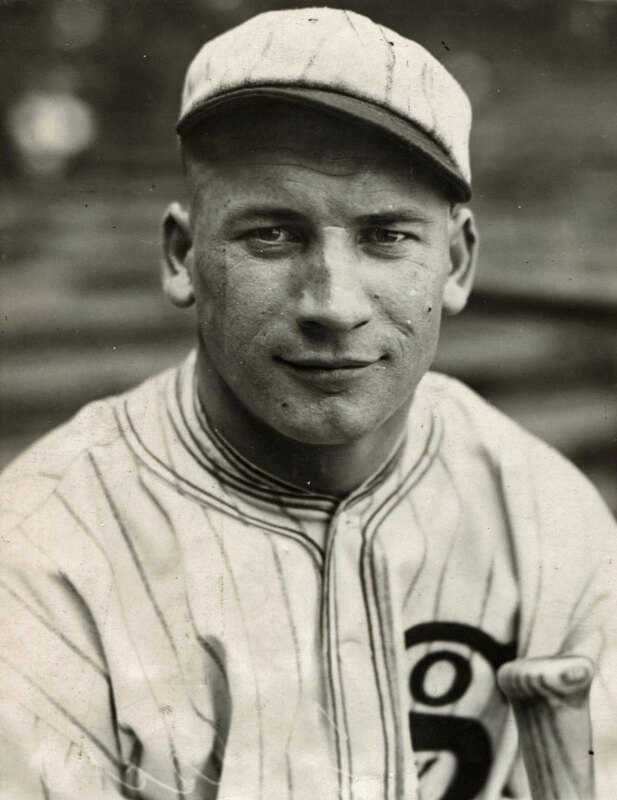 Backup first baseman Ted Jourdan was a frequent visitor to Athletic Park; he had a solid five-year career with the Minneapolis Millers (1919, 1922-24) after leaving Chicago. 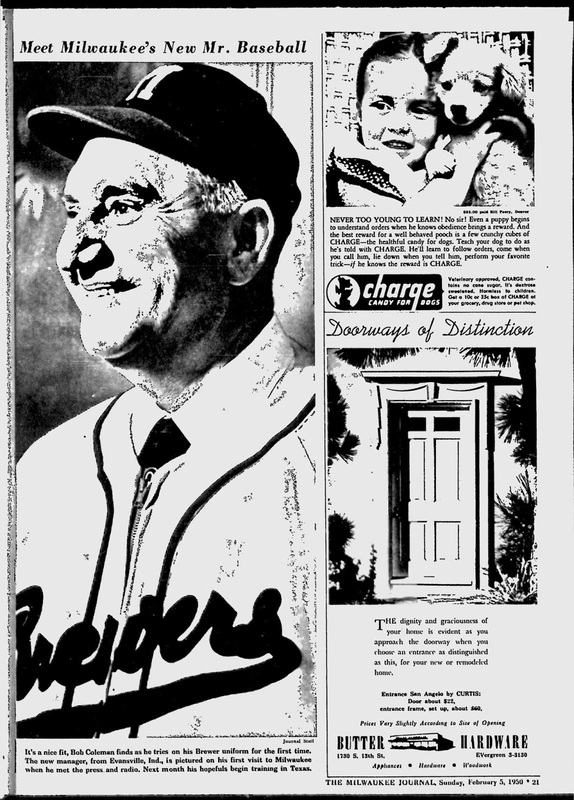 In the middle of the 1924 season, he got to see the home dugout when the Millers loaned him to the Brewers for 14 games. 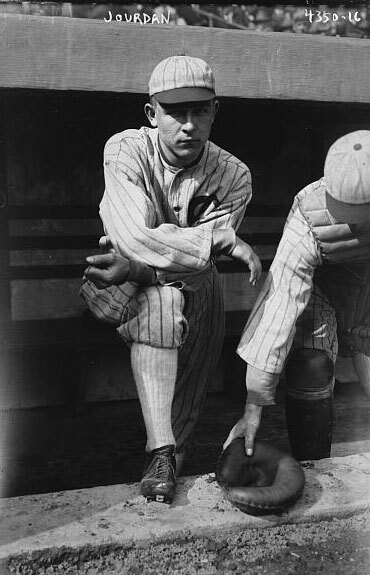 Lefty Dave Danforth pitched for the Brewers in 1926. He won seventeen games that season, including two during the club's 21-game winning streak. 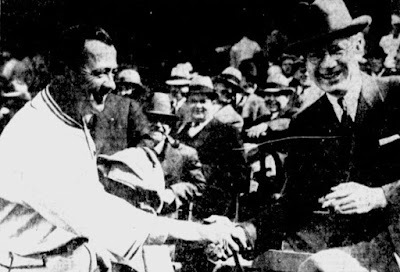 He struggled at the beginning of 1927, and just weeks into the season (and following the sudden death of team owner Otto Borchert) he was shipped off to New Orleans of the Southern Association. 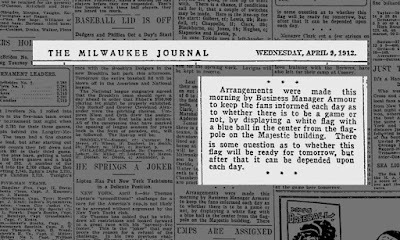 Now that you've met the Brewers' contribution to the 1917 White Sox, see if you can spot any of these men in the footage!